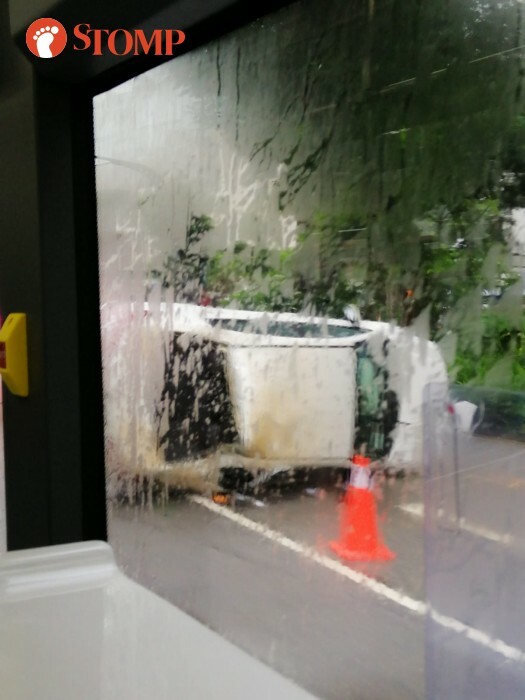 A 21-year-old man was arrested for drink-driving after the car he was driving flipped over along Bras Basah Road on Sunday morning (Nov 25). Three passengers were taken to hospital. Stomper Niger alerted Stomp to the incident and took photos of the car lying on its side near Rendezvous Hotel. He was passing by on a bus at about 7.55am. In response to a Stomp media query, the police said they were alerted to the accident along Bras Basah Road towards Raffles Boulevard at about 6.21am. The Singapore Civil Defence Force told Stomp they were alerted at 6.25am. The three passengers, each aged 21, were conscious when taken to Tan Tock Seng Hospital and Singapore General Hospital. Stomp understands that the passengers were two men and one woman. "The car driver, a 20-year-old man was arrested for drink-driving," a police spokesman said.